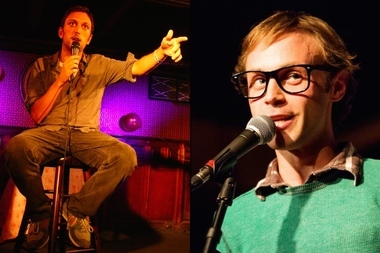 Comics Charlie Kasov, left, and Tyler Fischer, right, will co-host the "Big Break" comedy show, coming to Prospect-Lefferts Gardens this weekend. Both are from the area and wanted to start a show in their own neighborhood, they said. PROSPECT-LEFFERTS GARDENS — Stand-up comedy shows are coming to a new venue underneath the Bluebird bar and restaurant on Flatbush and Lefferts Avenues. Comics Charlie Kasov and Tyler Fischer will co-host the new “Big Break” comedy show at The Nest, a venue that quietly opened a couple of weeks ago in the lower level of the Bluebird at 504 Flatbush Ave. The first of the monthly shows will open May 16 at 8 p.m., said Kasov, who organized the show in part to bring entertainment to an area without many nightlife opportunities. "There's just not a lot of nightlife in Lefferts-Gardens," Kasov said. "There's two watering holes for Tinder dates and that’s it," he said with a laugh. Kasov said he and Fischer, who live around the corner from each other, wanted to bring comedy to their own neighborhood — especially since the Brooklyn stand-up scene is dominated almost exclusively by Williamsburg venues, with a of couple outliers like Union Hall in Park Slope and recently, 739 Franklin in Crown Heights that hosts a bi-weekly show. "When the manager was describing what the performance space would be like at Bluebird, I realized this could be like Union Hall, but on the east side of the park," he said. Four comics will perform at each show. This week’s line-up includes Nick Vatterott, Giulia Rozzi, Aparna Nancherla and Nore Davis — comics with a wide range of styles, from Vatterott's "crazy scenes" to Davis' dark and "very personal" material, Kasov said. The comedy show is the second regular performance featured at The Nest, said manager Karl Bernholtz. The classical Indian ensemble Brooklyn Raga Massive already performs a weekly show there on Wednesday nights at 8 p.m., he said, with different guest musicians joining the group every week. The Big Break comedy show starts at 8 p.m. on Saturday, May 16 at the The Nest at Bluebird, located at 504 Flatbush Ave. Tickets are $5 at the door.